End of Summer sale at Crabtree & Evelyn stores (or online) in the U.S. ends today! Take 20% off your purchase of $50 or more. 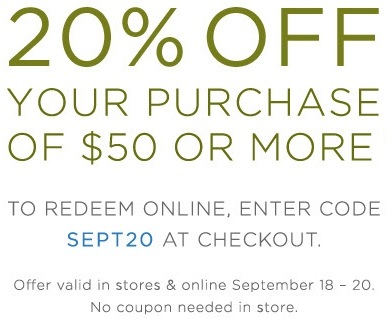 To redeem online, enter code SEPT20 at checkout. No coupon needed. Source of the information is Crabtree & Evelyn. Offer ends today (09/20/2015). More information available at stores or online.